With Super Bowl time coming up in a few weeks, we thought we would share this idea for a popcorn bar again, in case any of you are looking for an affordable way to throw a Super Bowl party! 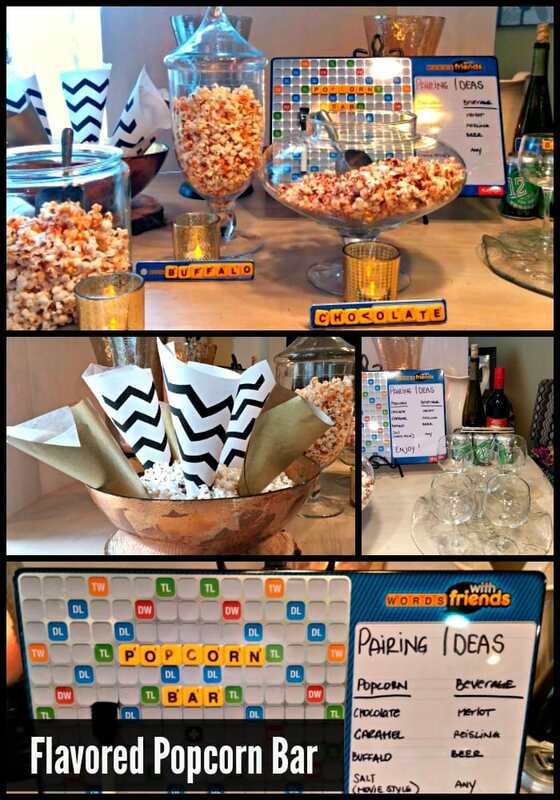 We love using a Popcorn Bar to entertain on a budget. Its a great way to have a fun snack for everyone, on a budget. 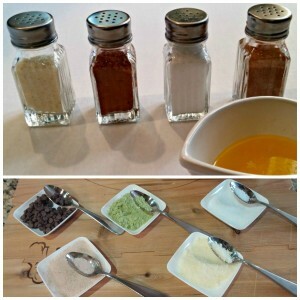 You can make a gourmet Popcorn bar, or keep it really simple with just a few ingredients. 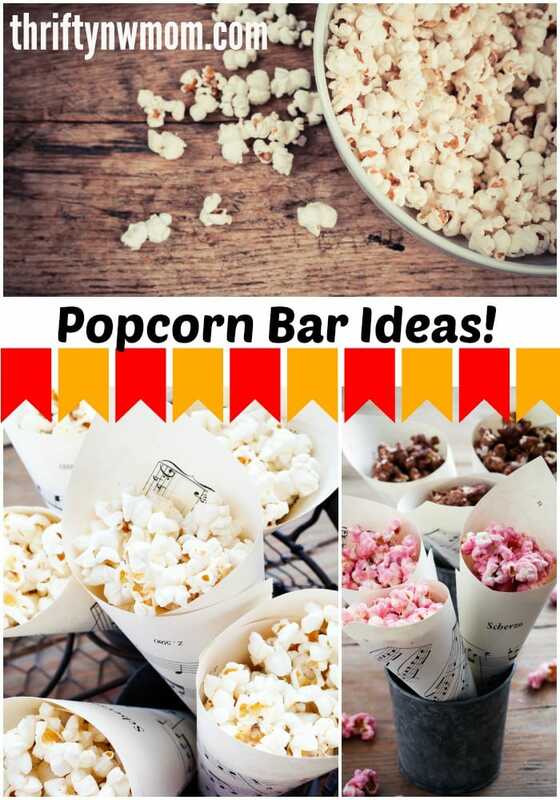 Popcorn bars are suitable for birthday parties, football and game day parties, holidays and just because. Sometimes I will put one out for my kids for an after school snack, and they love that. You could do a simple one for just a few dollars too! I love to use plain brown paper bags for serving, to keep it simple and affordable. You can decorate the outside of the bags ahead of time to make your popcorn bar look special. 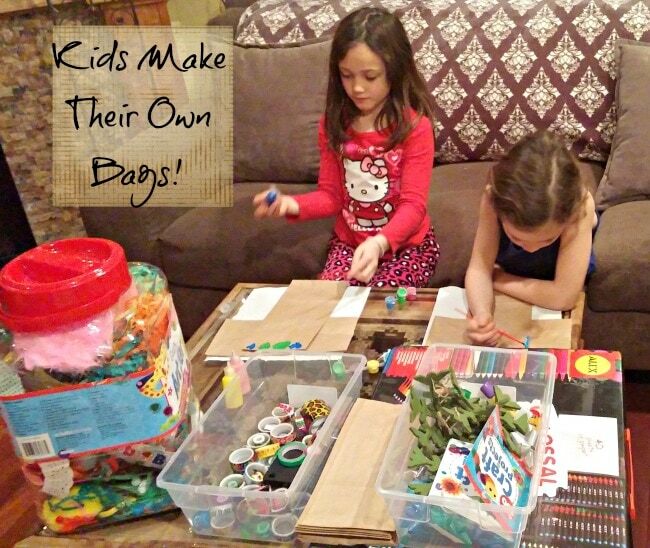 If its a kids party, you could have the kids decorate their own bags, so now its a snack and an activity, and you can get a bag of brown paper bags at the dollar store. Or, grab a roll of brown craft paper (I also find this for $1 at the Dollar Store), and make cones out of it to serve the popcorn in. The quick and easy route is to make a large pot of plain popcorn, and serve it up in a bowl with melted butter and topping options on the side. This option will take around 15 minutes to cook and set up, so super easy! 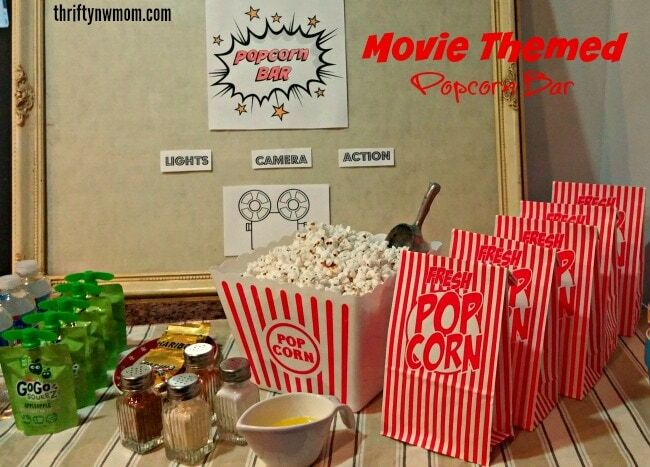 Movie Theater Popcorn Bar (this one is fun for family movie nights, or a teen party, and more). I found all of these items at my local Dollar Store, but Amazon often has great prices on similar products. We used a set of the Popcorn bags and popcorn tub, but you could use these cute Popcorn boxes or boats too. I find the bags easiest to use so folks can add butter and toppings, close up bag and shake it up well. I used a measuring cup for butter, added some salt, mexican chocolate, cinnamon and sugar and parmesean to the shaker sets we also found that the dollar store, so folks can top their own popcorn. A few simple pieces printed out clip art to finish off the decorations and this spread is ready to serve. 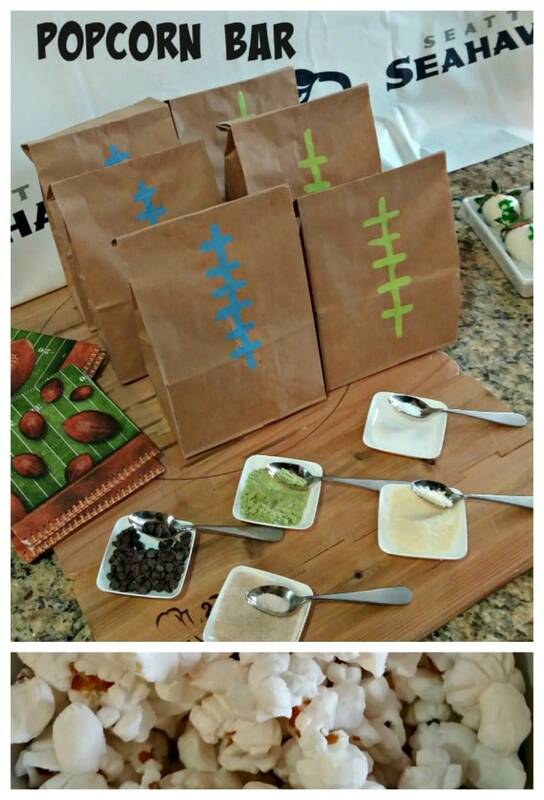 Football Party Game Day Popcorn Bar – Use brown paper bags to make faux footballs for folks to scoop their popcorn into. You could use a paint pen, craft paint, or white tape to create the laces look (but we loved the Seahawk colors)! 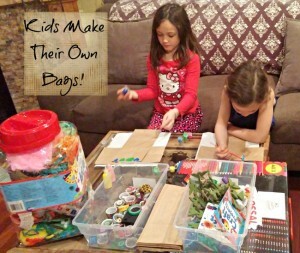 Kids Art Party – Let the kids decorate the paper bags themselves as an activity, and then they can use their own bags for their popcorn treat! You can also get all kinds of different colors for party bags, starting at just $1.49 per pack, if you are looking to coordinate them with specific party colors. 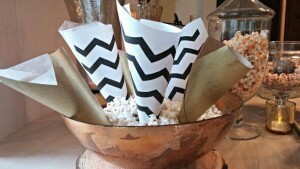 Grown Up Popcorn Party – Popcorn fun is not just for kids. You can make a few of your favorite popcorn recipes (see below for ideas) ahead of time, and display them in a few of your best containers (these 1 gallon glass jars would be perfect). Label them to let folk know what they are. You can even create a card to let folks know what the best drink pairing would be, if you are offering different drinks (ie the Buffalo recipe will pair well with beer, the ranch recipe could go nice with a bottle of dry white, the Mexican chocolate with a cab, etc). You can use your favorite paper for the Popcorn cones too. Simply wrap up a wax or parchment paper cone to put inside the decor paper to keep the buttery popcorn options from leaking through. I used a Friends with Words game for signage. You could search your local Value Village or Goodwill for affordable scrabble games and use the letters from those for a similar look. I have a popcorn popper, but if you do not, you can simply make it in a large stockpot over the stove top. To make popcorn over the stove you will need a 6-8 quart stock pot. Set it on a burner, on medium heat and add 2 tbls of oil. Let the oil heat up, then add a 1/2 cup of popcorn seeds and cover with the lid. Gently shake the pan so that the oil covers the seeds and let it sit on medium heat until you hear the popcorn start popping. Once popcorn starts popping, you can gently move the pan (shake lightly) back and forth to keep popcorn on the bottom from burning. Once the popping noise stops, remove from heat immediately. Note – you will want to have some melted butter available for folks to add to their popcorn first so that these toppings will stick. If you wanted to take the easy route, you can buy an 8 pack of Kernel Season’s Mini Jars Seasoning Variety Packs for under $15 too. One easy tip to make a fun party popcorn is to prepare a baking tray with parchment paper, and lay out popped popcorn on the tray. Melt a bag of marshmallows in the microwave (put marshmallows in microwave safe bowl, and cook for approximately 1-2 minutes, depending on your microwave). Once marshmallows are melted you can add in 1/2 stick of butter, salt, chocolate, toffee pieces, or any other flavors that sound good to you. You can also use food coloring if you are going for a certain color scheme for your party. Pour marshmallow mix over your popcorn, mix, and let it sit until it firms up. You can then add single serving sizes to the paper cones to serve. 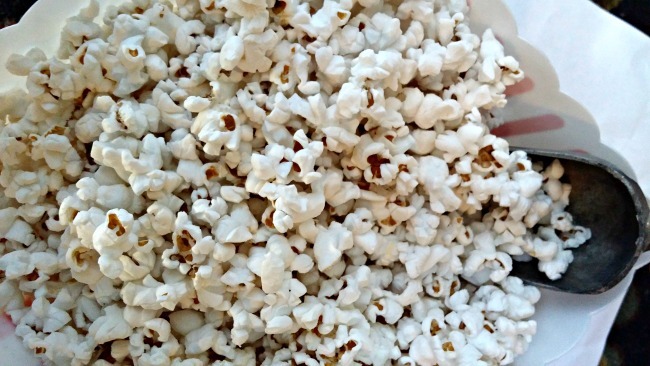 Looking for more gourmet popcorn recipes? The Food Network has 50 Popcorn Recipes here you can use. We loved the Frito Pie, Bacon Chive, Baffalo and Maple Pecan especially! Great thrifty ideas, thanks. FYI–On second line of popping instructions you wrote “…cover with kid” when you meant cover with the lid, LOL. Oh no – thanks for letting me know Tami. I will get that fixed asap (although, my kids did look like they were covered with popcorn this week as we recreated these bars for the post – ha! !